The new year is upon us and with it comes new resolutions. Consider using this time as a learning opportunity to review with your child what they accomplished last year and what they hope to accomplish in 2017. Try these simple steps with your child for them to learn from last year. Here are five steps that can help your child create resolutions for 2017 while learning from resolutions from last year. If your child didn’t set goals or resolutions for 2016, that’s OK. Use this year as a foundation to review in 2018. Part of New Year’s resolutions is reviewing what was accomplished at the end of the year. This exercise works well when you and your child look at the resolutions together. It provides great one-on-one quality time to talk about what resolutions were accomplished, what weren’t accomplished and why. 2. What topic did you study last year that you want to learn more about this year? When you ask your child a broad education question, like “how was school?”, they tend not to elaborate with their answer. When you ask them about what topic they studied last year in school that interested them the most, then you can make that an educational priority in 2017. If they are passionate and curious about this certain topic, you can have them write it down as a resolution to learn more about it. This also provides you as a parent the ability to create learning opportunities outside of school that involve the subject. Try using games, going to an event or location that creates even more interest in the subject. 3. How did you help somebody last year? How do you want to help somebody this year? Educating your child on the value of helping others provides a positive foundation for developing feelings of empathy and support. One way to do this is through volunteerism, which we talk about in a previous blog post. Ask your child about if they helped a specific person (other than their family) in 2016. Ask about details of their deed and how helping that person made them feel. Give them a chance to think about and decide on what deed or deeds they would do in 2017 to help others. Try to guide your child into an action that can be done throughout the year. 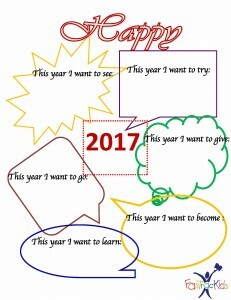 Filling out a New Year’s resolutions sheet can help your child visualize their goals for the year. One-on-one quality time to create these goals helps your child talk through their choices. It also allows you to use your review of 2016’s resolutions as part of making new resolutions. Print this sheet out and have a completed version in an easily visible space. Resolutions are hard to accomplish without an active plan. Have your child discuss what actions they can take to accomplish their goals. Have them start by thinking about what they can do each month, then start getting details on each week and day. The more details your child discovers about how to achieve their goals, the more prepared they will be to accomplish them. It also allows your child to look at their resolutions and see if they need to be modified based on how they plan to accomplish them. 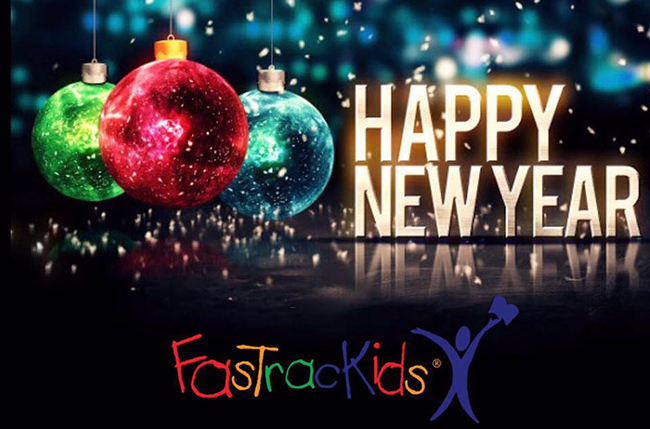 We hope that 2017 is full of learning adventures and successful resolutions for you and your child!